I learned to use a sewing needle and thread at an early age (5) because my Grandma had patience to teach me during summer vacation, and I’m sure I would have bugged her to death had she not let me try. I got the hang of it pretty quick from what I recall. I made so many doll clothes that summer, I could hardly fit them in my suitcase when it came time to go home. A few years went by and my interest in sewing never waned, so my daddy surprised me with my very own sewing machine. 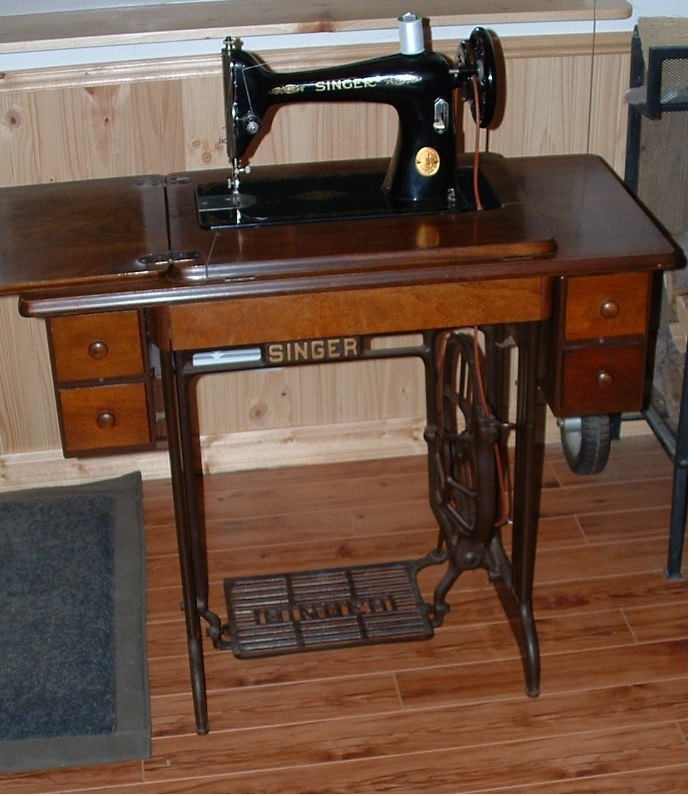 It was a gift from an old friend of his who had an antique Singer machine, operated by a foot treadle. That winter, my mom finally bought me my very own sewing kit, equipped with a pair of shears (fabric scissors) and tailors chalk and a pack of needles and some thread and marking paper. I was so excited to use all of it right away. Mom and I went to the store to buy a pattern for me to try. I was well on my way to my very first machine sewing experience. I’m sure that I was literally jumping up-and-down. Last week, June 23-26, 2015, was the first week of Summer Art Camp and my Sewing with Felt class was a big hit with five students ranging in ages 6-10. We made rice filled, pocket size, hand warmers by sewing together felt pieces and filling them with grain. Simple hand sewing techniques were taught. They learned three basic stitches: straight stitch, back stitch and whip stitch. We had fun making them into penguin and kitty cat shapes. (Penguin project) (Pocket Kitty Image) We also made a handy little pouch in the shape of an owl adding a ribbon strap for carrying (Owl Pouch image from Pinterest, Joanns.com). Glitter glue was used to decorate the owl pouch when the students finished sewing it up. All girls love glitter! The younger students had to have some help when it came to threading the needle and knotting the thread, but the three older students caught on quickly. All of them completed their projects gleefully and displayed them for photographing as you can see below. Two students continued to practice their straight stitches by creating pouch bags using ribbon and felt to carry all of their creations home after Show-and-Tell on Friday. It was a very fun group to teach. Stay tuned for more as the classes fill up and continue through the month of July, 2015. I am so glad that you blogged about this! it is so helpful to those of us who do not readily value ourselves or what we make. Contemplating a pricing examination in my shop on Etsy. but the Spring fashion message went beyond “make love, not war.” so says, Style.com. 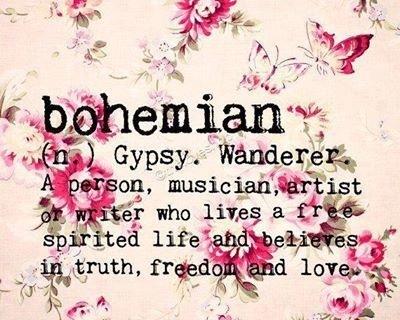 BoHo is a nick name for Bohemian. Bohemian Style is predicted to be HOT again this year. 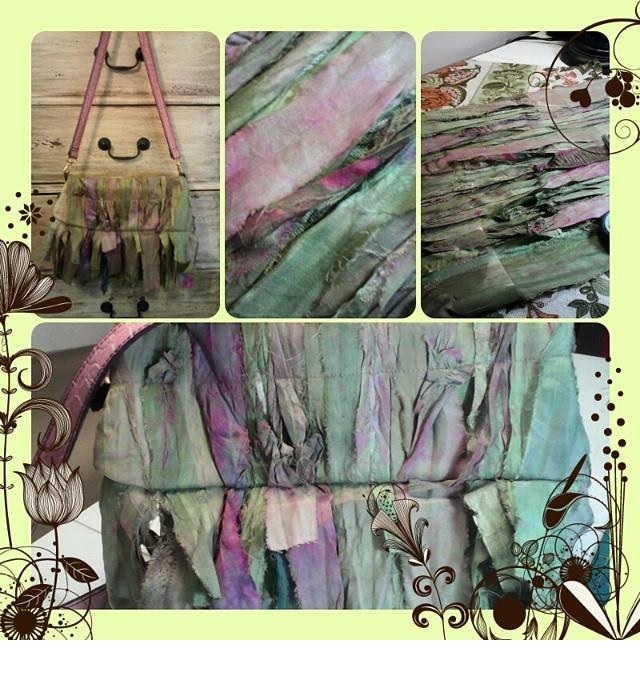 And you will see the trend for BoHo Bags and Purses continue in my online studio (https://www.etsy.com/shop/GreenCraftStudio). Bohemian Style still shows up on the Wedding Scene this year, too. Along Vintage or Country themes here are a few other popular style trends for 2015 to keep in mind: Love for Camo, all things Western or Earthy, as well as Modern Geometrics. It seems that, as far as Wedding trends go, anything goes this year from earth tones to bright colors that really pop. 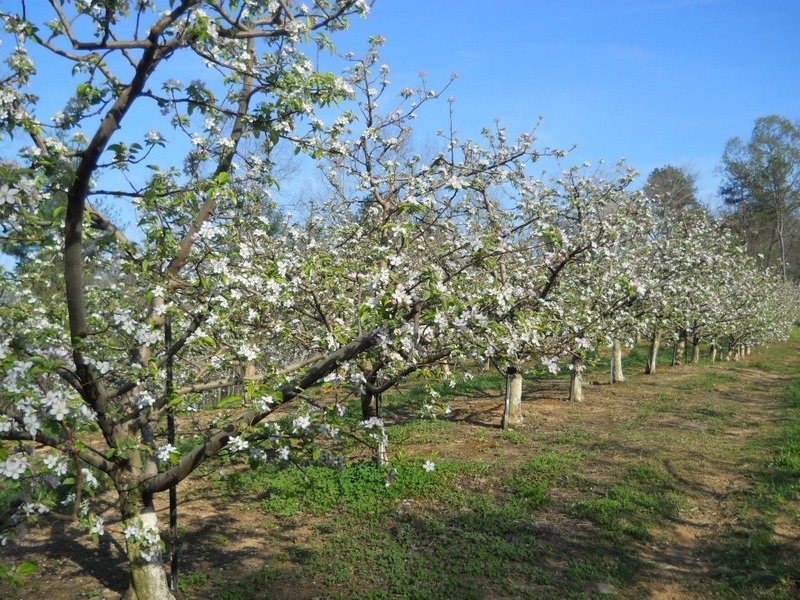 No matter what your reason is for checking out the 2015 forecast for trends, here are a few links you should definitely check out! If you find more trending 2015 links in your research, please feel free to share them in the comments below the post. “Camouflage is a trend,” confirmed Carolynn Bahem, owner of Royal VIP Studio in Marshfield. 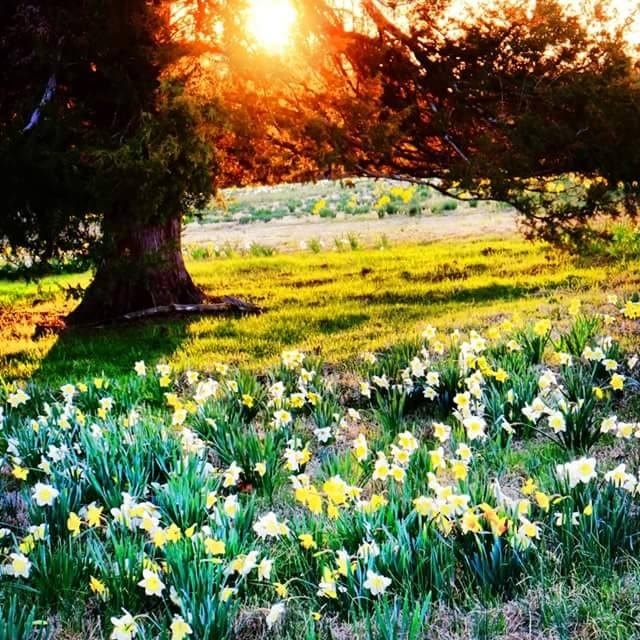 She has seen an increase in sales of brands such as “Country Life” that feature camouflage, for which she credits the rise of popular shows such as Duck Dynasty. I will be very busy this month and next, creating new stock for the fall festival in October. So, today I decided to go ahead and write a ‘peek-a-boo’ post to share my latest craze–sewing w/sari silk. These little bags are gonna be all the rage this fall, so…..do you want to know where they will debut? Read on! The Flapper Bag is a large fully-lined, machine washable, tote style bag with layers of horizontal, ragged ruffles sewn into the front of it. 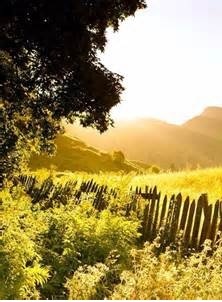 Its a real shabby, country chic look. This new shabby bag is much smaller and designed with busy, shopping divas in mind. Don’t you just love the raggedy fringe at the bottom of the flap? The sari silk ‘ribbon’ was purchased from a supplier who up-cycles the product and sells it as ‘yarn’ or ‘ribbon’ online @ Etsy. (I am so happy to find a supplier who feels the same as I do about using products to keep them out of landfills.) Let me know what color you would like to see for fall… check out all the many color-ways available @Etsy: https://www.etsy.com/shop/FeltBetter. As a matter of fact, tomorrow, I will place a custom order button for this new bag in my Etsy shop. All of you who read this blog will get free shipping when you order 2 or more of these bags, use this coupon code (FREESHIP2) when ordering now through November 2014. Painting on Fabric: Is it durable? Washable? Permanent? Sunflowers are popping up all over the landscape here in North Georgia this month. Seeing them in all their glory moved me create my own canvas (apron fabrics) covered in sunny flowers. My artist friend, Sue King, does this all the time. She paints pillows and aprons using items from nature like leaves for stamping on neutral cloth. She heat sets the paint after it dries. I hesitated to do this technique in the past because i didn’t think it would be very durable. Turns out it is very durable. Sue showed me how durable it is when I realized how often she uses and then washes her painted tablecloth–its white cotton with leaf stamping in burgundy, browns, rusts, & greens. 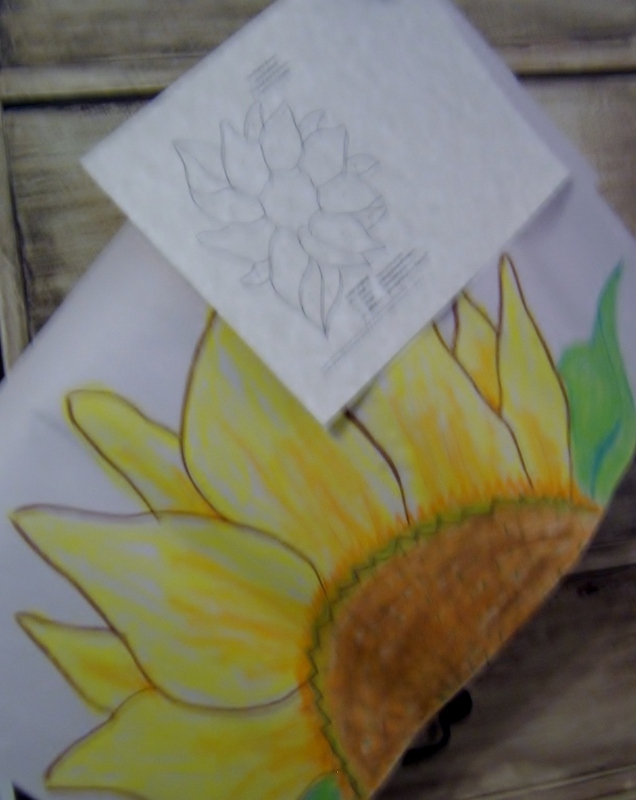 I searched magazines and books and images on the web for ideas for sunflower designs and color. I had some green burlap to use for a ruffle trim on the apron and used that color green in the center of my design. I also painted the ‘seeds’ so that the fibonacci pattern was evident. I wanted it to be somewhat realistic, but not perfect. I found a simple outline drawing in a color book to be the most useful when I began the process on the fabric. I sketched the design onto craft drawing paper to use as a visual aid as I worked on the fabric with the paints. I colored it with oil pastels. It seemed so easy to do, I was ready to begin on the fabric. Sketch the design and color it. 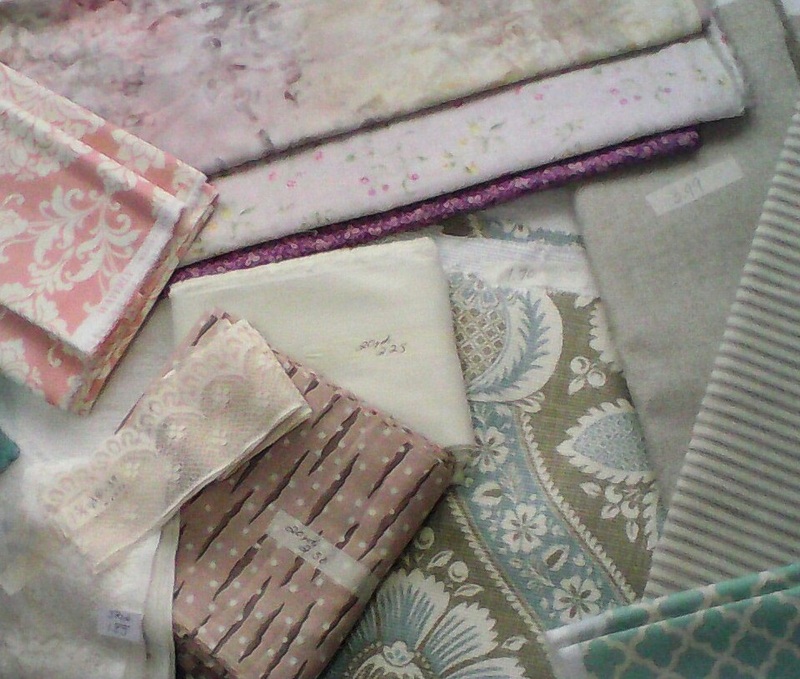 I cut out several aprons from a lightweight ivory fabric in the studio stash pile. I taped it to a board to keep it smooth as I worked with it. That tip came from watching Sue in her studio. I sketched the design to the cloth, enlarging it from my drawing. And then I gathered the tools for the painting process and mixed my color palette. 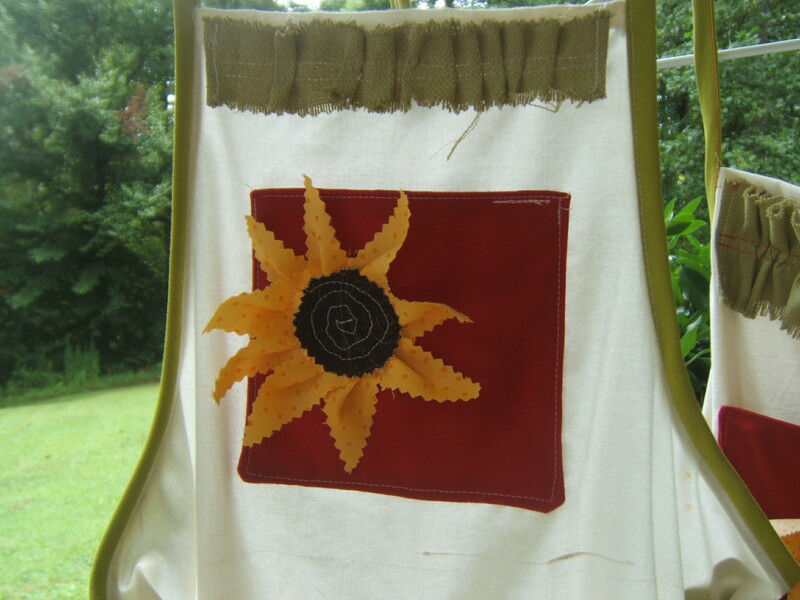 Before long I was fully absorbed in the process of creating my first sunflower apron. After I finished the first, I couldn’t stop. I was having too much fun to call this work! Which is why I love working in my Green Craft Studio. I get to make things that I love for others to appreciate and then love. As I work on my second sunflower apron, a memory floods my mind and won’t let go. Its a memory of a photograph of my first home grown sunflower plant. 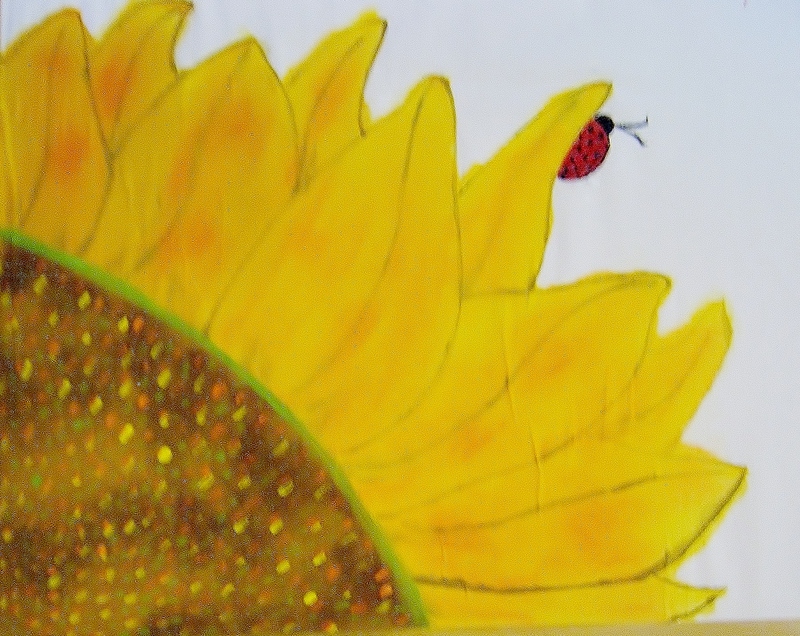 (Here I am at the end of Summer 2014, creating a sunflower on fabric, and this memory pops up like the sunflowers I see in my current landscape.) The memory is vivid, and it moves me to add another dimension to this apron. A dimension that was not in my design drawing. It’s a ladybug! I didn’t see the ladybug until after we got the film developed. The added apron detail of the ladybug called for a red pocket accent to which I added a fabric flower applique to set the whole apron off. The green burlap ruffle trim finishes it perfectly. As far as the painting process goes, I started off using tiny brushes and then moved on to a tiny sponge roller for the big sections and the background coloring. The tiny flat sponge applicators worked well for the wide outline around the seed center. Paper plates and plastic spoons worked great for mixing the palette. I used acrylic craft paints in a matte finish. After the painted fabrics dried I heat set each painting from the back of the fabric using a low heat iron. I then washed them in cold water in the washing machine to test the paints. Durable! I dried them in the dryer and pressed them out before finishing the details of the pocket, trims and ties. One of these is going in my Etsy shop and another is going off to be reviewed for a blog feature in November. 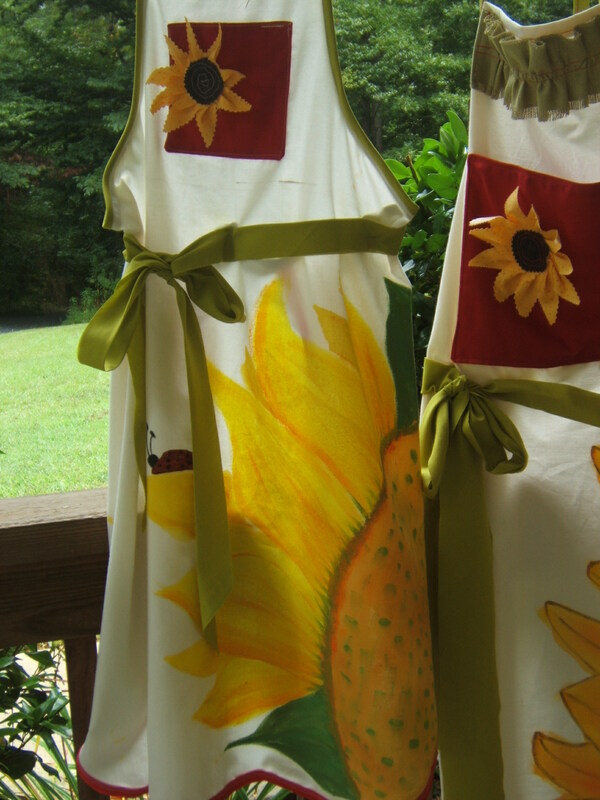 Elizabeth of Building Bridges Marketing was nice enough to reach out and I am excited to see what she says about my prototype painted aprons. November 16 is my feature date for her blog, so look for my Etsy shop feature article and read the review. It’ll be my first professional review and, quite frankly, I am on pins and needles!